A German panzer crewman stands over the grave of two fallen panzer crewmen – potentially from the Panzer I in the background. Most likely this photo is taken in 1941 during Operation Barbarossa, as the black panzer beret – the schutzmütze – was phased out and production had ceased in 1941, however it continued to be worn after that date for a while. The surviving crewman is wearing the newer style of panzer crew headgear which was introduced in early 1940. 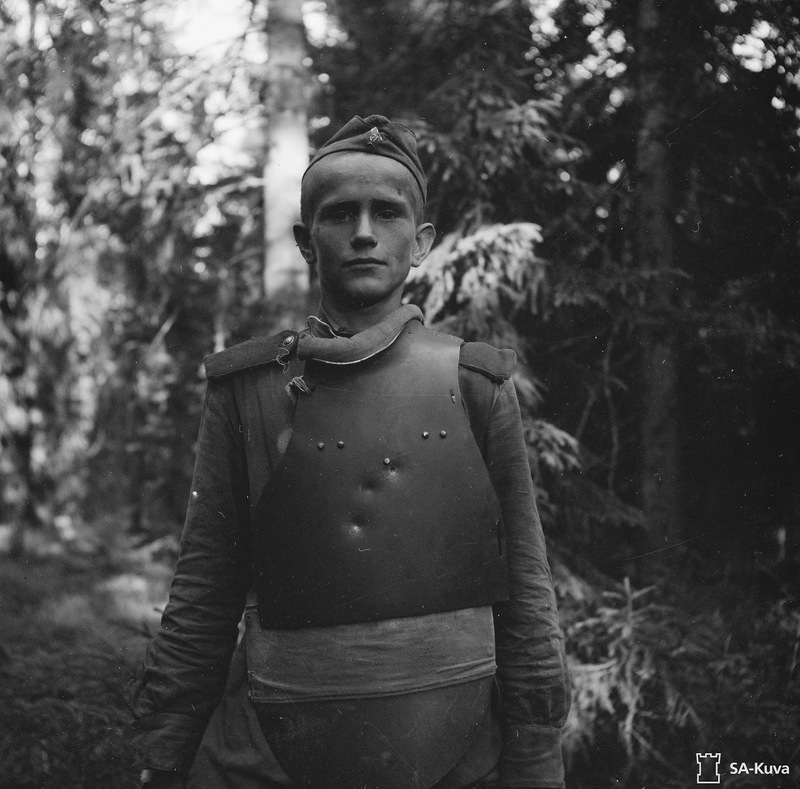 Stalnoi Nagrudnik – the steel bib, designed to stop the 9mm pistol round and potentially even a round from a rifle as long as it did not hit directly front on. In this photo three non-penetrating bullets have hit the front of the vest and have been successfully stopped, saving this young soldiers life. In the breakout from the Normady beachhead on the road to Perriers, two US GI’s take cover behind dead cows. In an exposed position like a road, any cover can be the difference between life and death. Depending on where you are in the world, today is either the 73rd anniversary of D-Day, or it’s the day before D-Day. It’s the day when the Allied forces returned to mainland Europe, many soliders on both sides lost their lives on this day, and in the many days to come. Into the jaws of death, US infantry disembark landing craft at Omaha. 82nd Airborne and French Resistance discussing the situation during the Battle for Normandy. British troops taking cover while waiting to move off ‘Queen White’ beach, Sword Area. A LCM landing craft evacuates casualties from the D-Day invasion beaches. Hopefully you enjoyed this daily historical photo series, as we come to some of the more momentous days in WWII history we will do more series like this.